The Leader-Manager Development Framework comprises 28 modules, structured around self efficiency, manager bias and leader bias. Each of the 28 skill development modules has a cluster of four related skills which directly impact on the performance of the skills in that particular cluster. These structures provide the learner or the talent development leader, for example, with the means to identify specific skills that can assist in incremental performance improvement, where a skill development need within a specific cluster, has been identified. For example, if there is a need to improve self efficiency and time management is proving to be an issue, then reference to the skill cluster will show that priority management, delegation management, objective setting and personal organisation may well require attention, too. The diagram illustrates the design of the learning process in the Skillogy PERFORM® ability model and leader-manager development framework. The design is based on references to the work of Bloom and the subsequent changes to his Learning Taxonomy, carried out in 2001 by Anderson & Krathwohl as well as the research carried out by David Kolb in creating the Experiential Learning Cycle. The Skillogy PERFORM® knowledge content presented to the leaner is relevant, topical and of a high quality. The presentation in the course tutorial is specifically designed to provide the learner with concise, bite-sized learning which is easily remembered. Interactive visuals and animations are provided to complement the knowledge. At this level, the aim is to have the learner reflect on the learning content and build a ‘picture’ of how this relates to their current circumstances. A skill overview and summary of key points are also provided to further aid memory retention. An assessment of knowledge is undertaken prior to commencing a module, to establish a baseline and on completion, to enable an assessment to be made as to the level of knowledge attained. In addition to the subject matter content, each course tutorial can contain a selection of exercises, tests, projects and case studies as well as video and external resources, to assist in developing an understanding of the skills and abilities discussed. Levels 2 and 3 are closely linked in terms of knowledge gained and how this is to be applied in the context of the learner’s job role and responsibilities. This is an important stage in the development process, in ensuring that what has been gained in knowledge is now transferred into tangible actions that result in positive performance change. To achieve this the learner is provided with implementation guidelines, in the form of action points, setting out what the learner is required to carry out and practice. 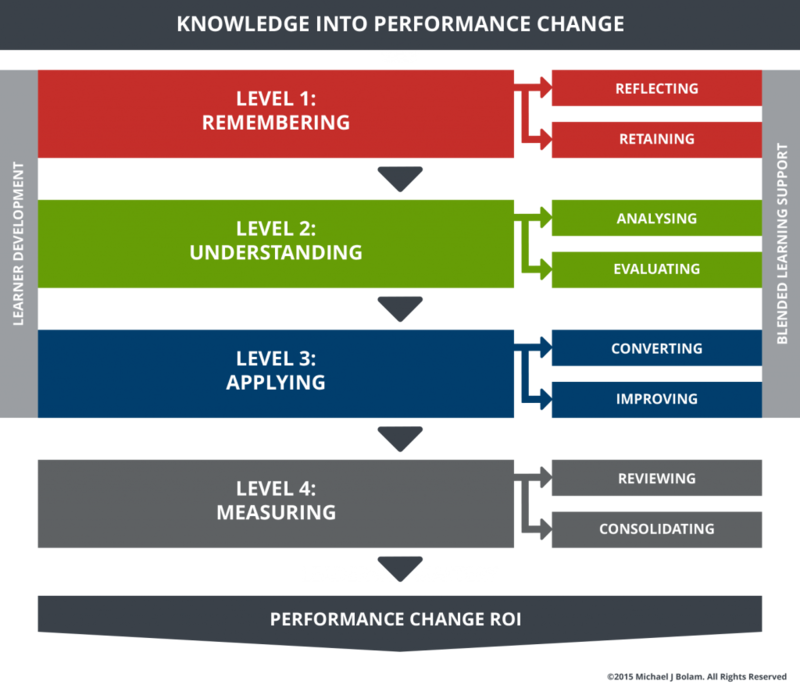 The learner uses these guides for implementing performance change. A development plan containing an action plan, activity log and a two-part review provides clear evidence as to how the learner is progressing and the degree of success being made in improving performance. Interventions can be made where appropriate to support the learner’s development. The metrics are based on a review of the module aims and objectives, specific quantifiable objectives set by the learner, in conjunction with their talent development leader, the evidence of actions and activities carried out on the job and recorded in the action plans, as well as a discussion with the learner on identifiable changes and improvements in behaviour and outcomes. Normally, these metrics are tested at individual, team and organisational levels to ensure that potential issues relating to the organisational environment are taken into account and addressed. In this way ROI metrics are integral to the successful completion of a soft skill module or series of modules. At the centre of our Skillogy PERFORM® delivery process is Skillogy CAMPUS® – a Moodle learning management system or Virtual Learning Environment (VLE), which powers the learner interface to courses, resources and communication activity, as well as the administrative and reporting functions associated with the learning.